NEW YORK--(BUSINESS WIRE)--Revlon, the iconic cosmetics company, is excited to announce a unique collaboration with Google as they launch an animated, shareable Valentine’s Day e-card powered by Google technology. Beginning today, consumers will be able to create a personal Valentine’s Day .GIF allowing them to send bespoke messages of love to someone special, making each consumer part of Revlon’s worldwide LOVE IS ON™ movement. Using Google technology consumers simply select their favorite Revlon Ultra HD™ Lipstick Color, upload an image of their Valentine (or themselves), and watch as the perfect kiss - the physical symbol of love – is placed directly on their cheek. The result is a shareable .GIF, with a special love note that can be placed on any social media channel (e.g., Facebook, Instagram, Twitter, Google+) or personal email making this the perfect e-card of choice for Valentine’s Day. 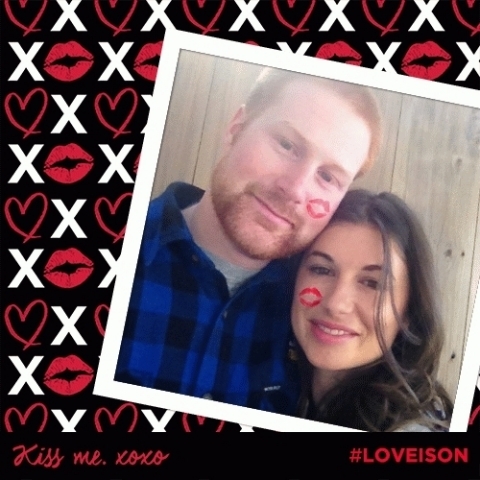 Consumers are encouraged to use the hashtag #LOVEISON when sharing on social media for a chance to be featured on the Revlon Global Love Beacon in Times Square. Consumers can become part of the LOVE IS ON movement by creating and sending their custom .GIF through any of the Revlon expandable engagement ads across desktop, tablet and mobile on the Google Display Network. This allows engagement to be simple and easy as consumers will not have to be redirected to another site in order to create their personalized Valentine message. Additionally, consumers can visit www.Revlon.com to create their “photograms” and learn more about REVLON LOVE IS ON™. For more information about Revlon visit: www.revlon.com, YouTube, Facebook, Twitter and Instagram @Revlon. Revlon is a global cosmetics, hair color, hair care and hair treatments, beauty tools, men’s grooming products, anti-perspirant deodorants, fragrances, skincare, and other beauty care products company, which operates in two segments, the consumer division (“Consumer”) and the professional division (“Professional”). Revlon’s vision is to establish itself as the quintessential and most innovative beauty company in the world by offering products that make consumers feel attractive and beautiful. Revlon believes that its global brand name recognition, product quality, R&D, innovation and marketing experience have enabled it to create leading global consumer and professional brands. Revlon’s Consumer segment global brand portfolio includes Revlon® color cosmetics, Almay® color cosmetics, SinfulColors® color cosmetics, Pure Ice® color cosmetics, Revlon ColorSilk® hair color, Revlon® Beauty Tools, Charlie® fragrances, and Mitchum® anti-perspirant deodorants. Revlon’s Professional segment global brand portfolio includes: Revlon Professional®, CND®, including CND Shellac® and CND Vinylux® nail polishes, and American Crew® men’s grooming products. Websites featuring current product and promotional information can be reached at www.revlon.com, www.almay.com, www.mitchum.com, www.revlonprofessional.com, www.americancrew.com and www.cnd.com.